Simcoe County Teacher Local President Janet Bigham has been honoured with the 2017 President’s Award. (TORONTO) Simcoe County Teacher Local President Janet Bigham received the prestigious annual President’s Award at the Elementary Teachers’ Federation of Ontario’s (ETFO) Annual Meeting today. 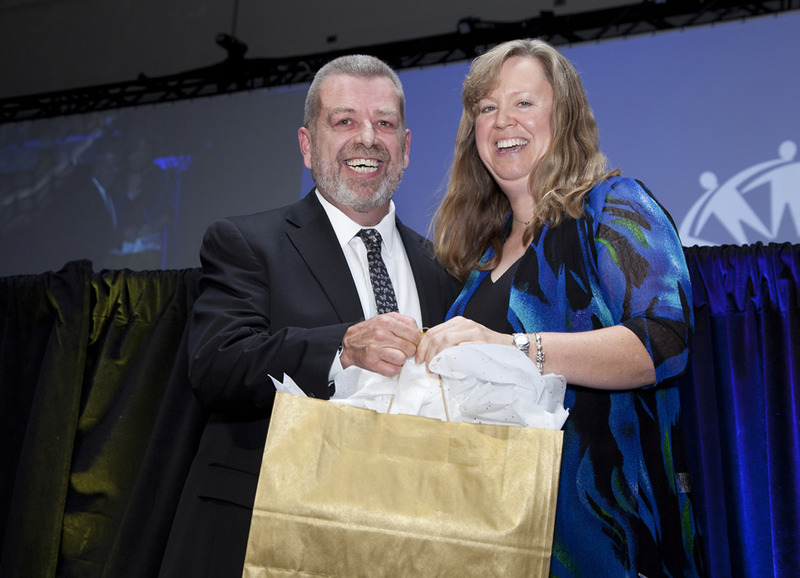 In announcing the award, ETFO President Sam Hammond paid tribute to the outstanding service that Janet has given to ETFO, its members and students in almost three decades of service. As president of her local, Janet represents approximately 2,400 teachers at the Simcoe County School Board. She was elected first vice-president of her local in 2006 and has served as president for 10 years. ETFO is committed to building better schools. Its Building Better Schools education agenda can be viewed at www.buildingbetterschools.ca. The Elementary Teachers’ Federation of Ontario represents 78,000 elementary public school teachers, occasional teachers and education professionals across the province.